After a brief explanation on how to install the fridge lock, our customer made her purchase. Once delivered, she found it was easy to install. The lock stopped her mother in law from constantly taking food from the freezer and putting it in different places throughout the house. This meant that when the carer visited she no longer had to find food stashed in all manner of places. Now, with the fridge lock securely in place, the frozen food remains in the freezer. A very happy customer who is helping us spread the word about our range of Fridge Locks and how effective they are for securing appliances for loved ones with dementia. 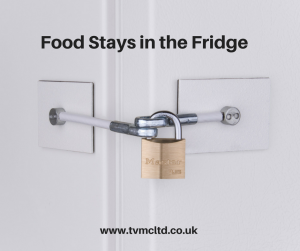 Do you know someone with dementia who would benefit from a fridge lock in their home to keep food and medicine safely locked away? Do get in touch or pass on our details because the team at TVM Cheltenham Ltd is here to assist you and your loved ones with safety and peace of mind in the home.